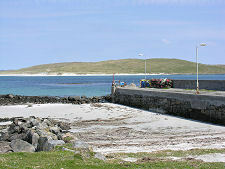 The Island of Barra (ignoring Vatersay) resembles a giant turtle swimming north east. The encircling A888 marks the outline of its shell, and there are four flippers projecting beyond it. Those at the front are more delicate: those at the rear are more heavily built. The neck of the turtle is the narrowing produced by Tràigh Mhòr on one side and Tràigh Eais on the other. And the head of the turtle is formed by the peninsula on which you find Eoligarry. Catch it in the right light and Eoligarry is the most magical part of a magical island. On a sunny day, blue is the dominant colour, and three shades of it in particular. The blue of the sky is reflected in a much darker shade by the deeper areas of sea: and where the sea is shallow and the sea bottom is sand, what you see is a truly glorious turquoise. This display of blues is set off to perfection by the beaches that surround much of Eoligarry and the islands of Orasay, Fuday and Eriskay to the east: huge swathes of stunningly white shell sand. Add some green for the grass and you've got most of the palette you need to paint a picture of Eoligarry. 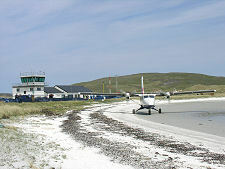 The gateway to Eoligarry is Barra Airport. 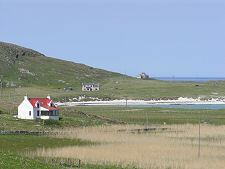 The remarkable sight of planes landing and taking off at the world's only tidal airport justly makes this an essential stopping off point on most people's tours of Barra. Not to mention the excellent cafe in the terminal building. 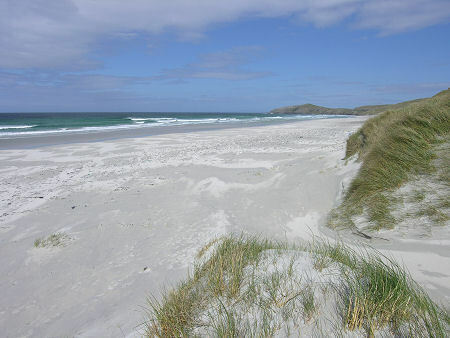 What is rather surprising, though, is that the airport lies just a five minute walk from one of the most spectacular beaches in the Western Isles, perhaps in Scotland, and it is comparatively rarely visited. Following a track away from the rear of the airport leads you over dunes to Tràigh Eais, a mile and a half of magnificent white sand pounded by deep blue Atlantic breakers. North of the Airport, the road passes Eoligarry Primary School and some new housing before bringing you to your first views north. 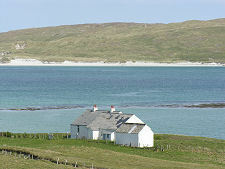 Eoligarry itself is a broad scatter of largely white painted cottages and houses. 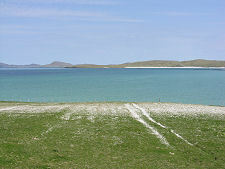 The only break in the colour scheme comes from a distant field in which it seems many of the island's old cars and other vehicles have gone to die: but the problem of the disposal of old vehicles applies across many Scottish islands and is certainly not unique to Barra. 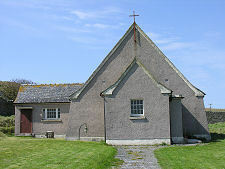 Any visit to Eoligarry must include two stopping off points as "compulsory". The first is Cille Bharra. Here you find the remains of a medieval church and ruined chapel, with a restored chapel nearby. 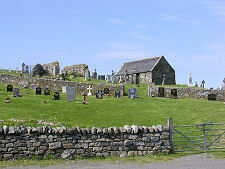 The upper parts of the surrounding graveyard offer some magnificent views of this end of the island. 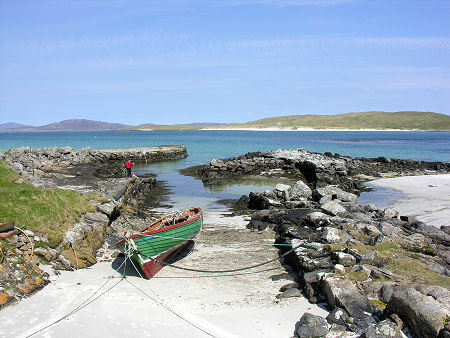 Any visitor also has to stop off at Eoligarry Jetty on the east side of the peninsula. Or perhaps "jetties" because there are a succession of them built in different eras and not all still standing. 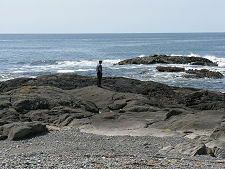 It is also worth visiting the northern tip of Eoligarry. En route you pass the rocky Bàgh nan Clach. A climb south from here takes you to the remains of Dun Sgoireabhail, a chambered hill fort.